DEHRADUN, 7 Feb: The economic professionals of Uttarakhand assembled at UPES for a ‘Talk & Session’ on the ‘Industry Perspective of Union Budget 2019’ on Wednesday at the Kandoli Campus of the university. 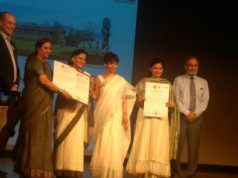 The event, organised under the aegis of the ‘Department of Economics & International Business’ of the School of Business (SoB) had the renowned Chartered Accountant and also the former Chairman, CII Uttarakhand State Council, Hemant K Arora as the Chief Guest and Sanjay Arora as well as Kamal Nagpal, both Members of CII. Hemant was welcomed by Dr Deepankar Chakrabarty, Dean, SoB. Arun Dhand, Director – Media Affairs, shared that the Union Budget, as a statement of the estimated receipts and expenditure of the government, was a much-awaited annual fiscal statement of the government by the industry. Dr Hiranmoy Roy, Head of Department – Economics & International Business, SoB, highlighted the mysteries and paradoxes of the macro economy in India at the inaugural session. The Chief Guest highlighted the importance of the budget and maintained its significance as a potent driver for economic growth of the country. Identifying the positives of the current budget and sharing the same with the gathering, he specifically highlighted the opportunities provided in the budget for the industrial sector. While sharing his assessment, the speaker threw light on its provisions particularly those made to boost the agriculture sector along with the Micro, Small & Medium Enterprises (MSME). “The decision to source 25% of the materials for all the government projects from SMEs out of which 3% are to be procured from only women-owned SMEs will usher more opportunities to the doorstep of SMEs. Further, exemptions in GST are a welcome step and a potent factor that can empower MSME sector. Similar good news for businesses in India is an interest subvention for SMEs for loans up to Rs 1 Crore,” he said. “These measures, along with the ongoing digitalisation and automation, will help SMEs and the online business in the country.” Praising the budget for being full of provisions that shall help in creating employment opportunities in the unorganised sector, he Hemant termed it equally significant as far as infrastructure growth is concerned. While summing up the session, he highlighted the other provisions of the budget for being inclusive, especially in the social sector viz. education, health, etc. Dr Anshuman Gupta, Professor, Economics, SoB proposed the vote of thanks. A large number of students of MBA – International Business; MA Economics; BA Economics; BBA Foreign Trade benefited from the session, which was also attended by faculty members Prof Anil Kumar, Prof Karunakar Jha, Prof Anshuman Gupta, Prof Prasoom Dwivedi, Prof DP Singh, Prof Tarun Dhingra, Prof CP Sharma from SoB and Prof Vijay from School of Law, UPES.